Ocean Power Technologies’ subsidiary California Wave Energy Partners in it’s “wave energy project proposed off Cape Mendocino has surrendered its Federal Energy Regulatory Commission (FERC) preliminary permit, making two major companies that have abandoned the area in the past two weeks. The moves come at a time when President Obama’s energy policy has cut funding for wave energy in favor of solar and wind energy development. The withdrawals leave GreenWave Energy Solutions LLC, with a permit off Mendocino, as the only local wave energy project. Pacific Gas and Electric Company announced earlier this month they would not seek to develop wave energy off Fort Bragg. However, PG&E has not yet legally abandoned its FERC preliminary permit. California Wave Energy Partners did just that on May 26, telling FERC their parent company, Ocean Power Technologies (OPT) was pulling out of California in favor of developing wave energy more seriously in Oregon. The project was proposed near Centerville off Humboldt County, south of Eureka on the remote coast of Cape Mendocino. “OPT subsidiaries are also developing two other projects at Coos Bay and Reedsport,” wrote Herbert Nock of OPT. “During the process of developing these projects, OPT has learned the importance of community involvement in the project definition and permitting process. “OPT therefore feels it is in the best interests of all parties to focus its efforts (in Oregon) at this time. This will allow the time and resources necessary to responsibly develop these sites for the benefit of the coastal community and the state,” Nock wrote. The Cape Mendocino project was to be situated in a prime wave energy spot, but with connections to the power grid still to be determined. The project was never the subject of a public meeting in Mendocino County and stayed under the radar compared to several other Humboldt County projects. PG&E still plans to develop its WaveConnect project off Eureka. Brandi Ehlers, a PG&E spokeswoman, said PG&E plans to relinquish the preliminary permit for the Mendocino Wave Connect project soon. She said the utility spent $75,000 on the Mendocino County portion of Wave Connect before stopping because Noyo Harbor was ill-equipped to deal with an offshore energy plant. “PG&E is not currently pursuing applications for new FERC hydrokinetic preliminary permits, but it is important that we continue to explore other possibilities,” Ehlers said in response to a question. Secretary of the Interior Ken Salazar has announced that his department will host 12 public workshops this month to discuss the newly-issued regulatory program for renewable energy development on the U.S. Outer Continental Shelf. All the meetings are to be held in large cities — in Seattle June 24, Portland on June 25, and San Francisco on June 26. Salazar restarted the process of building a framework for energy development in the ocean, which had been started in the Bush Administration but never finished. The new program establishes a process for granting leases, easements, and rights-of-way for offshore renewable energy projects as well as methods for sharing revenues generated from OCS renewable energy projects with adjacent coastal States. The rules for alternative energy development in the oceans become effective June 29. Most of the actual ocean energy development figures are for the Atlantic and Gulf of Mexico. The Pacific Ocean’s near-shore slopes are too steep and too deep for current wind energy technology. Wave and tidal energy are still in their infancy, not seen as able to help with President Obama’s energy plan. The Obama administration has proposed a 25% cut in the research and development budget for wave and tidal power, according to an in-depth report in the Tacoma, Wash., News Tribune. At the same time the White House sought an 82% increase in solar power research funding, a 36% increase in wind power funding and a 14% increase in geothermal funding. But it looked to cut wave and tidal research funding from $40 million to $30 million, the News Tribune reported. Editors Note: On June 9, 2009, PG&E filed with the Federal Energy Regulatory Commission (FERC) a petition to release the Mendocino WaveConnect preliminary permit. In early May 2009, PG&E’s WaveConnect team decided to cancel the Mendocino WaveConnect project because the Noyo Harbor didn’t pass muster and was deemed insufficient in several engineering aspects, therefore unable to support PG&E’s Mendocino WaveConnect pilot wave energy program offshore. PG&E summarily rejected re-situating the launch site to the Fort Bragg Mill Site, only a short distance from the Noyo Harbor, where PG&E could construct a state-of-the-art launch for Mendocino WaveConnect. PG&E plans to report their decision to the Federal Energy Regulatory Commission and anticipates surrendering the Mendocino WaveConnect FERC pilot wave energy permit. The City of Fort Bragg, County of Mendocino and the FISH Committee were brought up to speed by PG&E on May 11th. PG&E had raised $6mm in funding from CPUC and DOE for WaveConnect, allocated to both Mendocino and Humboldt projects. This remaining funds will now be directed to only Humboldt WaveConnect. And PG&E notes that Humboldt WaveConnect, at Humboldt Bay and its harbor, offers WaveConnect the required spaciousness and the industrial infrastructure as well as a welcoming, interested community. Three miles off the craggy, wave-crashing coastline near Humboldt Bay, California, deep ocean swells roll through a swath of ocean that is soon to be the site of the nation’s first major wave energy project. Like other renewable energy technology, ocean energy generated by waves, tidal currents or steady offshore winds has been considered full of promise yet perennially years from reaching full-blown commercial development. That’s still true – commercial-scale deployment is at least five years away. Yet there are fresh signs that ocean power is surging. And if all goes well, WaveConnect, the wave energy pilot project at Humboldt that’s being developed by Pacific Gas and Electric Co. (PG&E), could by next year deploy five commercial-scale wave systems, each putting 1 megawatt of ocean-generated power onto the electric grid. At less than 1% of the capacity of a big coal-fired power plant, that might seem a pittance. Yet studies show that wave energy could one day produce enough power to supply 17% of California’s electric needs – and make a sizable dent in the state’s greenhouse gas emissions. Nationwide, ocean power’s potential is far larger. Waves alone could produce 10,000 megawatts of power, about 6.5% of US electricity demand – or as much as produced by conventional hydropower dam generators, estimated the Electric Power Research Institute (EPRI), the research arm of the public utility industry based in Palo Alto, California, in 2007. All together, offshore wind, tidal power, and waves could meet 10% of US electricity needs. That potential hasn’t gone unnoticed by the Obama administration. After years of jurisdictional bickering, the Federal Energy Regulatory Commission (FERC) and the Department of Interior — MMS last month moved to clarify permitting requirements that have long slowed ocean energy development. While the Bush administration requested zero for its Department of Energy ocean power R&D budget a few years ago, the agency has reversed course and now plans to quadruple funding to $40 million in the next fiscal year. If the WaveConnect pilot project succeeds, experts say that the Humboldt site, along with another off Mendocino County to the south, could expand to 80 megawatts. Success there could fling open the door to commercial-scale projects not only along California’s surf-pounding coast but prompt a bicoastal US wave power development surge. “Even without much support, ocean power has proliferated in the last two to three years, with many more companies trying new and different technology,” says George Hagerman, an ocean energy researcher at the Virginia Tech Advanced Research Institute in Arlington, Va.
More than 50 companies worldwide and 17 US-based companies are now developing ocean power prototypes, an EPRI survey shows. As of last fall, FERC tallied 34 tidal power and nine wave power permits with another 20 tidal current, four wave energy, and three ocean current applications pending. Some of those permits are held by Christopher Sauer’s company, Ocean Renewable Power of Portland, Maine, which expects to deploy an underwater tidal current generator in a channel near Eastport, Maine, later this year. After testing a prototype since December 2007, Mr. Sauer is now ready to deploy a far more powerful series of turbines using “foils” – not unlike an airplane propeller – to efficiently convert water current that’s around six knots into as much as 100,000 watts of power. To do that requires a series of “stacked” turbines totaling 52 feet wide by 14 feet high. “This is definitely not a tinkertoy,” Sauer says. Tidal energy, as demonstrated by Verdant Power’s efforts in New York City’s East River, could one day provide the US with 3,000 megawatts of power, EPRI says. Yet a limited number of appropriate sites with fast current means that wave and offshore wind energy have the largest potential. Funding is a problem. As with most renewable power, financing for ocean power has been becalmed by the nation’s financial crisis. Some 17 Wall Street finance companies that had funded renewables, including ocean power, are now down to about seven, says John Miller, director of the Marine Renewable Energy Center at the University of Massachusetts at Dartmouth. Even so, entrepreneurs like Sauer aren’t close to giving up – and even believe that the funding tide may have turned. Private equity and the state of Maine provided funding at a critical time, he says. Venture capitalists are not involved in ocean energy right now, he admits. Yet he does get his phone calls returned. “They’re not writing checks yet, but they’re talking more,” he says. When they do start writing checks, it may be to propel devices such as the Pelamis and the PowerBuoy. Makers of those devices, and more than a dozen wave energy companies worldwide, will soon vie to be among five businesses selected to send their machines to the ocean off Humboldt. One of the major challenges they will face is “survivability” in the face of towering winter waves. By that measure, one of the more successful generators – success defined by time at sea without breaking or sinking – is the Pelamis, a series of red metal cylinders connected by hinges and hydraulic pistons. Looking a bit like a red bullet train, several of the units were until recently floating on the undulating sea surface off the coast of Portugal. The Pelamis coverts waves to electric power as hydraulic cylinders connecting its floating cylinders expand and contract thereby squeezing fluid through a power unit that extracts energy. An evaluation of a Pelamis unit installed off the coast of Massachusetts a few years ago found that for $273 million, a wave farm with 206 of the devices could produce energy at a cost of about 13.4 cents a kilowatt hours. Such costs would drop sharply and be competitive with onshore wind energy if the industry settled on a technology and mass-produced it. “Even with worst-case assumptions, the economics of wave energy compares favorably to wind energy,” the 2004 study conducted for EPRI found. One US-based contestant for a WaveConnect slot is likely to be the PowerBuoy, a 135-five-foot-long steel cylinder made by Ocean Power Technology (OPT) of Pennington, N.J. Inside the cylinder that is suspended by a float, a pistonlike structure moves up and down with the bobbing of the waves. That drives a generator, sending up to 150 kilowatts of power to a cable on the ocean bottom. 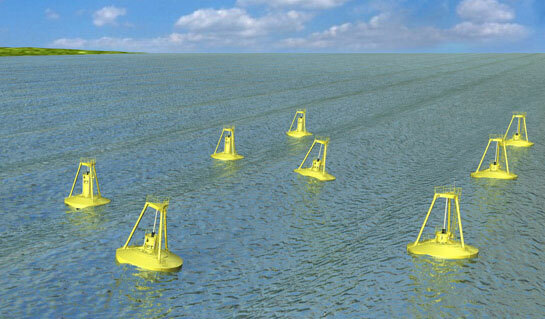 A dozen or more buoys tethered to the ocean floor make a power plant. “Survivability” is a critical concern for all ocean power systems. Constant battering by waves has sunk more than one wave generator. But one of PowerBuoy’s main claims is that its 56-foot-long prototype unit operated continuously for two years before being pulled for inspection. Beside survivability and economics, though, the critical question of impact on the environment remains. Mr. Dunleavy is optimistic that OPT’s technology is “not efficient enough to rob coastlines and their ecosystems of needed waves. A formal evaluation found the company’s PowerBuoy installed near a Navy base in Hawaii as having “no significant impact,” he says. Gauging the environmental impacts of various systems will be studied closely in the WaveConnect program, along with observations gathered from fishermen, surfers, and coastal-impact groups, says David Eisenhauer, a PG&E spokesman, says. Offshore wind is getting a boost, too. On April 22, the Obama administration laid out new rules on offshore leases, royalty payments, and easement that are designed to pave the way for investors. Offshore wind energy is a commercially ready technology, with 10,000 megawatts of wind energy already deployed off European shores. Studies have shown that the US has about 500,000 megawatts of potential offshore energy. Across 10 to 11 East Coast states, offshore wind could supply as much as 20% of the states’ electricity demand without the need for long transmission lines, Hagerman notes. While more costly than land-based wind power, new offshore wind projects have been shown in some studies to have a lower cost of energy than coal projects of the same size and closer to the cost of energy of a new natural-gas fired power plant, Hagerman says. Offshore wind is the only ocean energy technology ready to be deployed in gigawatt quantities in the next decade, Bedard says. Beyond that, wave and tidal will play important roles. For offshore wind developers, that means federal efforts to clarify the rules on developing ocean wind energy can’t come soon enough. Burt Hamner plans a hybrid approach to ocean energy – using platforms that produce 10% wave energy and 90% wind energy. But Mr. Hamner’s dual-power system has run into a bureaucratic tangle – with the Minerals Management Service and FERC both wanting his company to meet widely divergent permit requirements, he says. To be feasible, costs for offshore wind systems must come down. But even so, a big offshore wind farm with hundreds of turbines might cost $4 billion – while a larger coal-fired power plant is just as much and a nuclear power even more, he contends. The County of Mendocino has filed a Motion to Intervene in Pacific Gas & Electric’s Mendocino WaveConnect Project. This action is urgently necessary and required because the proposed project is located geographically in the County’s “backyard”, in the waters and on land adjacent to the County’s unparalleled and protectively developed coastline. While the County is certainly supportive of, and looks forward to, the possibility of a clean, renewable, energy source off its coastline, the potential for significant impacts to its coastal environment, its coastal communities and its economy, necessitates recognition of the County as a primary stake holder and participant as the Commission further considers PG&E’s Mendocino WaveConnect Project. The County filed the intervention with the Federal Energy Regulatory Commission (FERC), which has jurisdiction over these matters. The County’s coastline generates roughly twenty-five percent (25%) of the County’s income in visitor services, tourist-related dollars, and tourism. No other party to this proceeding adequately represents the County’s interests and the County only recently became aware that its interests are not adequately represented. On February 27, 2007, Pacific Gas and Electric Company (“PG&E”) filed an application for a preliminary permit for a project entitled Mendocino WaveConnect Project, located in Mendocino County, California. The objective of this project is to “demonstrate the feasibility of generating electric power from waves off the coast of Mendocino County, California. PG&E will obtain data and perform the acts required to determine the feasibility of a large scale wave energy project up to 40 MW in installed capacity, and to support an application for a license for such a project.” At this time, pursuant to its application, PG&E’s proposed project includes installation of an unknown number of wave energy conversion devices that would float on the surface of the ocean anywhere from one-half to six miles offshore. These devices would be moored and anchored by power cables to an undersea junction box, to be connected by a 40-kilovolt-transmission line from the undersea junction box to appurtenant facilities located in or near the City of Fort Bragg, California. Mendocino County is predominantly rural; approximately seventy percent (70%) of its 86,000 inhabitants live in the unincorporated areas of the County. Although PG&E’s application correctly asserts the City of Fort Bragg (“City”) is the only city with a population of 5,000 or more that lies within fifteen (15) miles of this wave energy project, and at is the preliminary proposed site of the project interconnect location, the proposed project potentially impacts the County’s entire 120 miles of coastline and its coastal populations for a number of reasons, necessitating the County’s intervention as a party to these proceedings. Mendocino County Board of Supervisors Chair Kendall Smith emphasized that the County’s adjacent coastal waters also support an active fishing industry community located both in and around the City of Fort Bragg and spans the entire length of the Mendocino Coast. This includes commercial and recreational fishing, crabbing, kelp harvesting, boating and navigation and other sports. The impact to the County’s fishing industry alone, valued last year at $5,763,0481, will undoubtedly have to be carefully examined and input from the fishing community seriously evaluated. PG&E does anticipate studying existing conditions to assess the potential effects of its project on three broad areas: marine life, use of sea space, and coastal processes. Its application covers a project four (4) miles wide in the east-west direction and seventeen (17) miles long in the north-south direction. Clearly, the project, the project assessment, and the project’s potential impact stretches beyond the confines of the City’s geographic boundaries and requires communication with, and participation by, the County as the project assessments are made and evaluated. Further, the County believes that it is highly likely that an impact in one area of its coastal waters will be readily transferred to adjacent areas of coastline by the actions of currents, patterns of marine migration, and channels of navigation. “The County’s coastal resources are interconnected, fragile, and finite. The County believes its development must be undertaken only with extreme care, safe guarding both our economic and environmental resources,” stated Mendocino County Board Chair Kendall Smith. 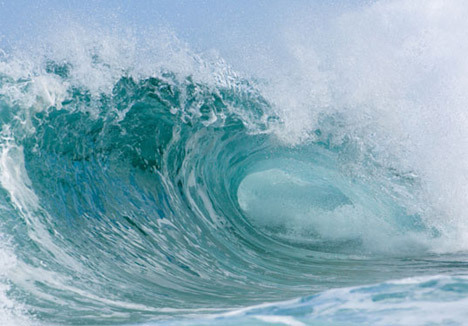 Pacific Gas and Electric Company’s wave energy project, “WaveConnect,” has become the first project of its kind in North America to help accelerate the development of wave energy technology. With the filing of two preliminary permit applications with the Federal Energy Regulatory Commission, PG&E plans to study whether it would be environmentally safe and economically feasible to generate electricity from wave power at two sites off the Mendocino and Humboldt county coasts. If approved, PG&E plans to spend $3 million over the next three years exploring wave energy. If PG&E finds wave power to be profitable and safe for marine life, it would then build two wave-power generating facilities, each capable of producing approximately 40 megawatts of power per year. Forty megawatts would power an estimated 30,000 homes for a period of 12 months.